Osteoarthritis (OA) is among the leading causes of disability in the United States, affecting approximately 47 million people and costing the country over $100 billion each year. Roughly 12% of OA cases are caused by joint injury and are therefore classified as post-traumatic osteoarthritis (PTOA). Although the etiology of PTOA is not fully understood, cell death has been implicated as a key factor in the pathogenesis of this disease. In particular, cartilage impact trauma induces immediate, focal cell death that leads to the release of harmful intracellular contents into the extracellular space. As a result, surrounding cells begin to undergo necrosis and apoptosis (i.e., “programmed” cell death) and the area of cell death expands. Importantly, recent studies suggest that expansive cell death precedes chronic structural damage of cartilage in PTOA. Therefore, instantaneous and short-term cell death may represent the critical tipping point in PTOA pathogenesis. Since the pre-apoptotic stage of PTOA represents a possible therapeutic window for PTOA, much research on cell death in PTOA has focused on strategies for inhibiting chondrocyte apoptosis. However, as the first stage of PTOA, short-term cell death is an alternative and attractive target for treatment and prevention of this disease. Unfortunately, the mechanisms of chondrocyte death immediately after mechanical insult have not been rigorously elucidated. Our experiments have uncovered a surprising and novel mechanism of cell death in cartilage following mechanical trauma: membrane rupture due to tensile stresses experienced during the removal of an extreme contact force. Although murine chondrocytes are highly resistant to cell death during application of an extreme compressive force, rapid removal of this force induces reproducible cell death in just a few seconds. We call this process cell lysis after removal of compression (CLARC). Our finite element simulations that account for the “triphasic” material properties of cartilage—i.e., its solid component, its fluid component and an ionic phase—demonstrate that sudden unloading of an injurious force can induce a tensile stress in individual cells that exceeds the critical stress for membrane rupture. Thus, our overall objective in this research is to establish CLARC as an important factor in the development and progression of post-traumatic osteoarthritis and a possible target for preventative care. Our experiments are performed using a custom, microscope mounted device that enables simultaneous live/dead imaging and tracking of local strain in fully intact mouse cartilage subject to controlled compressive stresses. 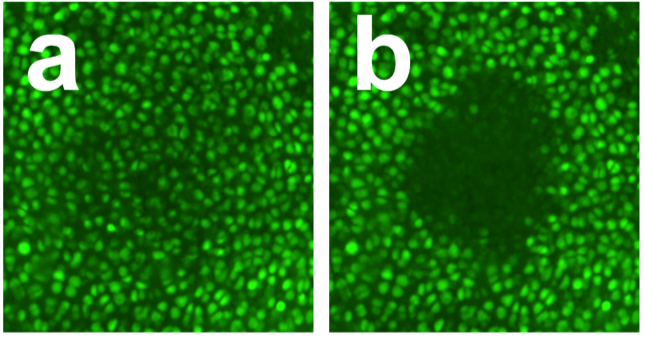 Cartilage surface on a representative femoral condyle fluorescently stained with calcein AM, an indicator of live cells (a) 500 s after sudden application of a 7 MPa contact stress and (b) 500 s after the load is suddenly released. Note that extensive cell death in the region of contact occurs only upon unloading.